“I’m stoked to come away with 4 th – conditions were crazy and considering my injury – it is a victory in itself. 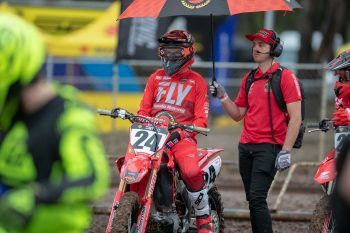 It’s also a testament to the Honda for getting through all of that mud fault free.” Metcalfe said. “Six weeks ago I didn’t know if we would make round 1, I didn’t know if we would made rounds 2 or 3 so once we got clearance, Metty rode the bike for less than an hour before this weekend and he came out and took 4th. That is a testament to his unwavering commitment and desire to succeed. No matter what the odds, I am glad we backed one another and came out here to round 1 fighting. His fourth place finish exceeded our expectations and put the team in a great position,” Konsky said.